Ik ben de afgelopen tijd bij een aantal conferenties geweest. En een van de problemen daarbij is dat je nooit alle (goede) sessies kunt gaan bekijken. En daarom ben ik ook blij dat in toenemende mate sessies van conferenties worden opgenomen en online beschikbaar gesteld worden. Dan kun je er een aantal daarvan achteraf nog eens op je gemak bekijken. En dat geldt natuurlijk niet alleen voor deelnemers, maar ook voor de mensen die er niet bij konden zijn. Daarbij is het zo dat ALT er het langst van de drie over gedaan heeft om bronnen online te krijgen, EDUCAUSE heeft de meest uitgebreide bronnen (ook veel presentatiebestanden e.d.) terwijl SURF en Kennisnet heel snel de video’s online hebben weten te krijgen. De presentaties van de sessies zijn hier te vinden. p.s. en als je je nou af vraagt waarom ik hier de afgelopen dagen niet vaker geschreven heb over Dé Onderwijsdagen, die blogs staan allemaal hier op het Dé Onderwijsdagen weblog! [update 21:20] Link naar presentaties toegevoegd. 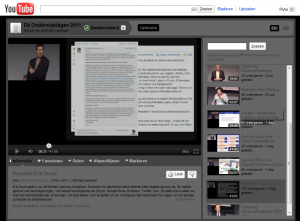 It makes only sense that I spend my last post about ALT-C 2011 on the final keynote and final session of the conference. And, although I do understand some of the remarks I’ve heard about the keynote by John Naughton (how cool is it to have your own Wikipedia page? ), I did enjoy it. Yes, it was scripted and he read it from his iPad without using any other media (no video, no graphics, not even a PowerPoint slide with his name on it). And yes, I knew about how the music industry completely missed the boat during the rise of the internet and I knew about Craigslist and what it did to the newspaper industry. But at the end of a conference like ALT-C it is nice to just hear those stories again and just think about them. And even though we all are involved in innovative projects, trying to improve our organisations using ICT, trying to get students involved in the educational process, it might just be that the future is there and we simply don’t see it yet. ALT-C 2011 Day 3 I Have a Blind Student in My Maths/Science Class, Should I panic? I’ll admit it: I did not know who Dónal FitzPatrick was when I decided to attend his session. I had read the title: “I Have a Blind Student in My Maths/Science Class, Should I panic? How to promote inclusion for blind students” and found that interesting enough to attend. So when he said that he wasn’t going to use slides during his talk because that would make us realize how it is for a blind student to attend a lecture, I at first thought that he was just making a point. It took me a couple of minutes to realize why he was the right person to make that point: Dónal himself has been blind all his life. During his session Dónal talked about a number of problems that blind students face in a Math/Science class. For example: equations that are printed in course material can be turned into audio representations. However, this brings additional cognitive load issues for blind students have. Dónal has researched ways to optimize the audio representations by adding extra pauses, pitch changes etc. to lessen that load. It was a shame that only a small number of people had managed to find their way to the The Bragg Cluster for the session titled “Standards-based Assessment – Creating Innovative, Interesting, Interoperable Resources Using QTIv2.1” by Sue Milne, Niall Barr and Graham Smith. It may have been the great number of steps that you have to climb to get to the room. 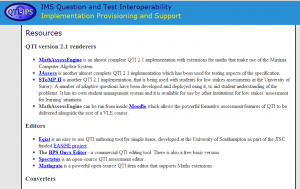 Personally I enjoyed getting an update on the status of QTI 2.1 in particular related to the Math part of it. It was nice to see how some of the tools have progressed even though it still sounds like somewhat of an uphill struggle. Strange, because enough people agree on the fact that you need interoperability when you develop assessment material. 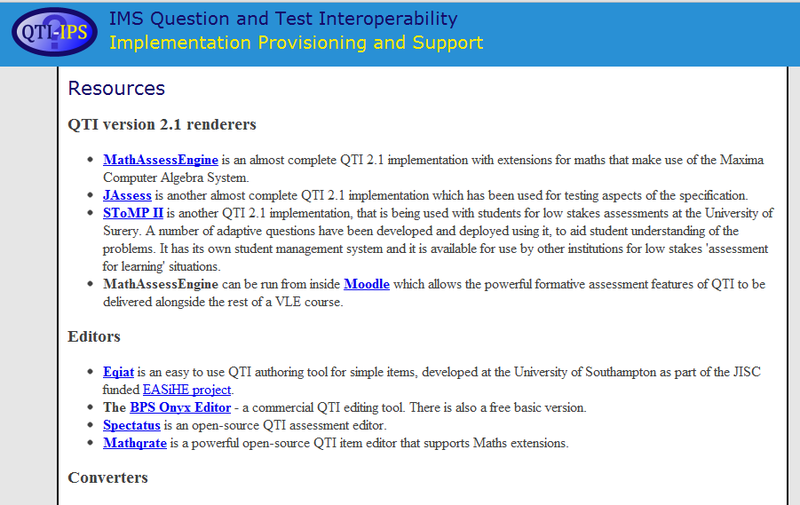 If you did miss the session and want to check out the available QTI related resources, have a look at this webpage. ALTC-2011 Day 2 Can one tool change the culture of an institution? 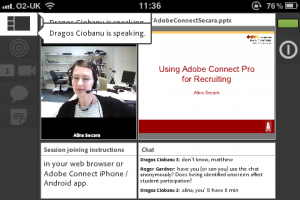 Dragos Ciobanu, Neil Morris and Alina Secara showed how at the University of Leeds, they are experimenting with Adobe Connect Pro. Here too, they luckily choose to just demonstrate instead of explain in words only. We had received the URL for their Adobe Connect room so anyone with a laptop, iPad, iPhone, Android device could participate during the session. Alina Secara provided us with a remote overview of the use of Adobe Connect for remote recruiting. But I was most impressed by the use demonstrated by Neil Morris. He uses Adobe Connect in his lectures as a combination of a replacement for a Twitter backchannel and a lecture recording tool. He opens the presentation he’s using as a shared screen in Adobe Connect, uses PaperShow to annotate them, while the students use the (anonymous!) chat function of Adobe Connect to respond to the lecture, ask questions etc. He does not use a moderator, meaning he is multitasking a lot. He said that the students often are their own moderators, answering each others questions. But it requires a level of trust and mutual understanding so that the students don’t misbehave in the online environment. Still, I have given an number of online presentations using Adobe Connect, and would not like to have to do that without a moderator helping to streamline the question/discussion part of a session. 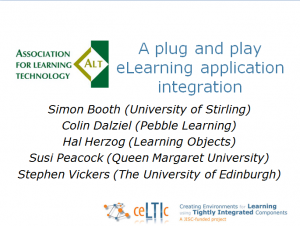 Simon Booth from the University of Stirling and Colin Dalziel from Pebble Learning gave an overview of the use of LTI as part of the ceLTIc project. LTI stands for Learning Tool Interoperability and is a mechanism with which it should be easier to connect different systems. For example, you have Moodle as your VLE and want to use PeddelPad. Through the LTI support available in both systems, you can easily set up a link between the two tools, provide students with single sign-on and eliminate the need for them to have account for each and every system. And the best thing, both from an administrative point of view, and from a system developer point of view, is that that connection can just as easily be made from say Blackboard to PeddlePad, because Blackboard also supports that LTI specification. 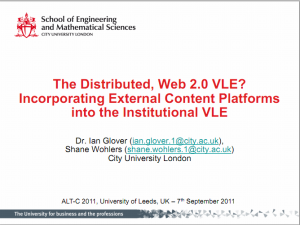 ALT-C 2011 Day 2 The Distributed, Web 2.0 VLE? 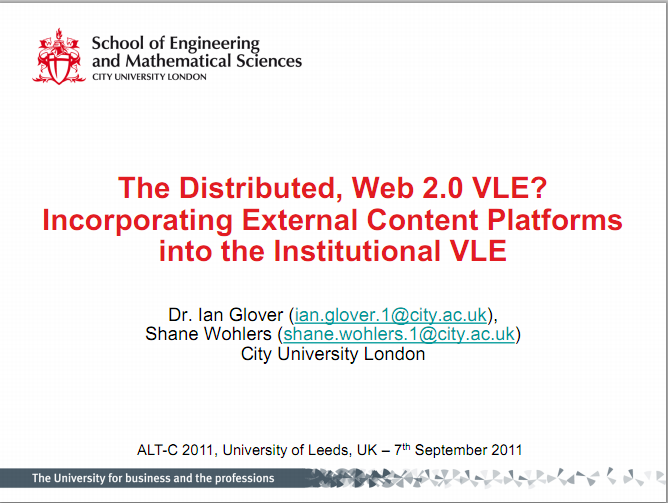 In his presentation titled “The Distributed, Web 2.0 VLE? Incorporating External Content Platforms into the Institutional VLE”, Ian Glover from the City University London talked about the advantages/disadvantages of using external tools in combination with the institutional VLE and the work they are doing to help staff use these external tools. Advantages of using these tools are there are many good and free tools that often do one thing very well. People may already be using those tools and they can increase the visibility/findability of work and ideas. However, there are also disadvantages. You have no or little control over them. A resource could change over time without you wanting it to change, the system could be down at a critical time without you having an SLA. There may be changes in the licensing/availability (eg. Ning – free service revoked or Google Wave/Lively – completely shutdown). There might be Security/Privacy/Copyright/IP issues related to the use of the external tools. Who is responsible if a student gets cyber bullied through Facebook if you’ve said they are supposed to use Facebook? Or what if your students bully others? I’ve uploaded the presentation of my session to the CrowdVine system used during the conference, but that part can only be access when logged in to the system. 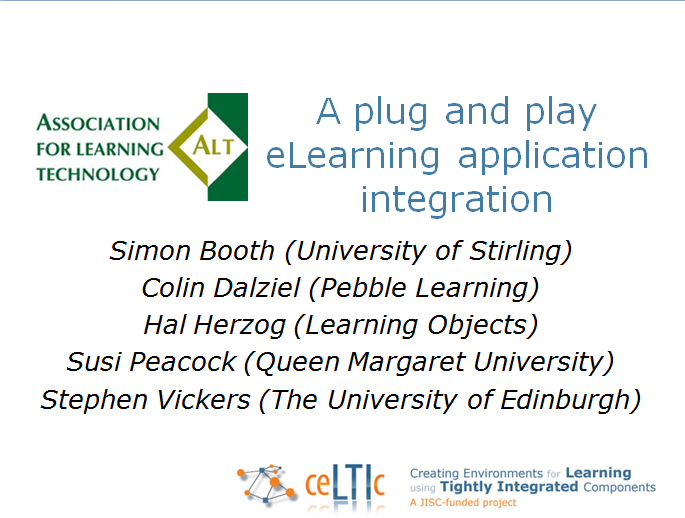 So I also uploaded the presentation to Slideshare where it is available to anyone. 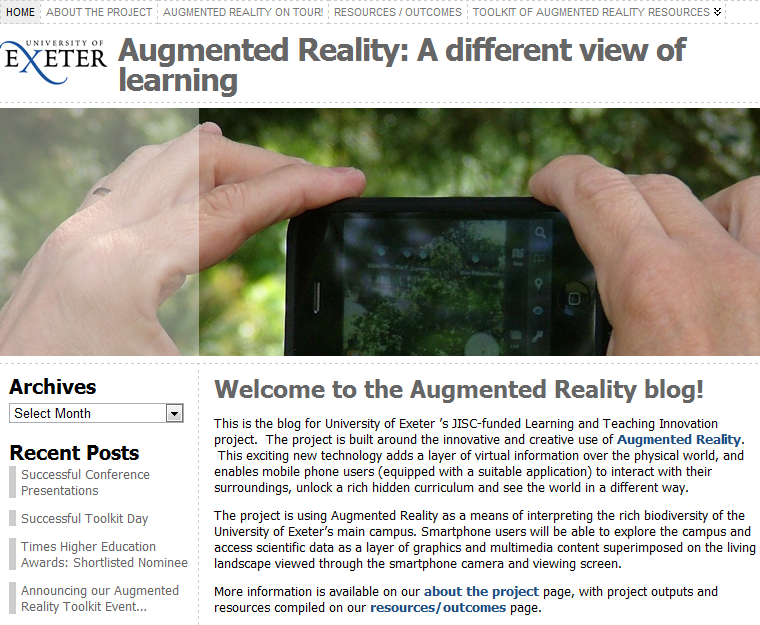 Link to their showreel video of how they’re using the technology at the University of Exeter. Set of Toolkit resources, designed to help others create AR education applications. 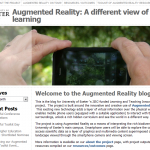 Instructional fact sheet on the ‘Hoppala Augmentation’ service, offering a graphical web interface to create augmented reality contents with just a few mouseclicks. Video showing feedback from educationalists during their Toolkit day on campus. 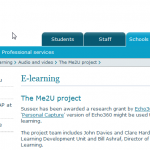 John Davies and Clare Hardman from the Teaching and Learning Development Unit of the University of Sussex did an interesting session about their Me2U project. 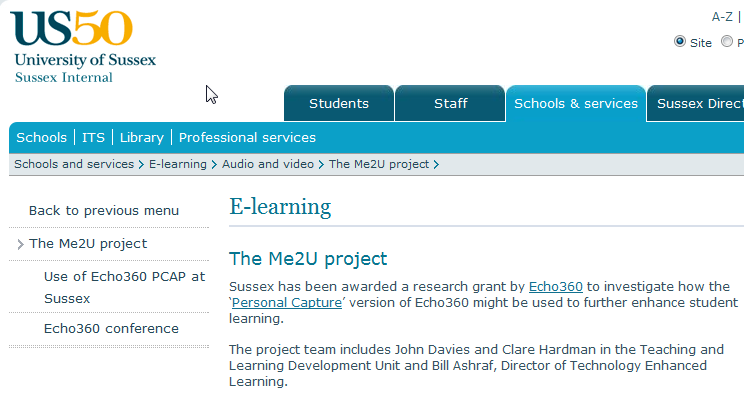 They use the Echo360 Personal Capture system with which teachers can create (small) recordings on their laptops. 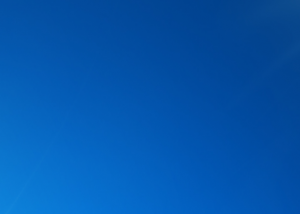 It works similar to what I would do with Camtasia Studio, but without the more advanced options. However, this also makes it easier for faculty to use. They found similar results as that we found in our study: students that accessed the recordings had better marks for the course, though that doesn’t automatically prove causality. They also compared the results of the two groups of students (the ones that watched and didn’t watch) for a course that ran at the same time and that wasn’t recorded and there there was no significant different between the results of the two groups. More information about the project can be found on this website. A short introduction to the session by John Davies, using the Echo360 Personal Capture system, can be found here.